I have been wanting to make these for awhile and finally had the chance. Of course most of those benefits will come from raw honey and this is cooked honey but still, as far as treats go this is a great option. These little lollipops are great for children that might be feeling ill or wrap these up and gift them to adults too. 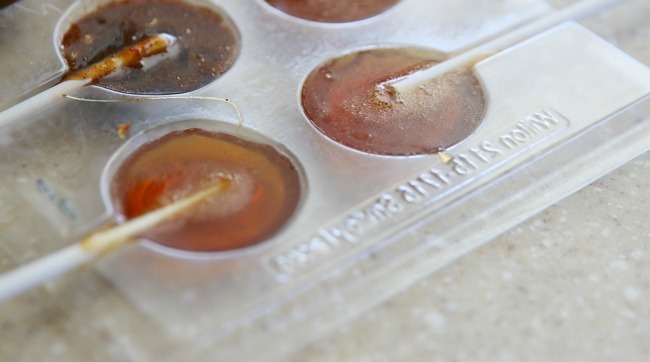 These lollipops are wonderful stirred into hot water or hot tea. 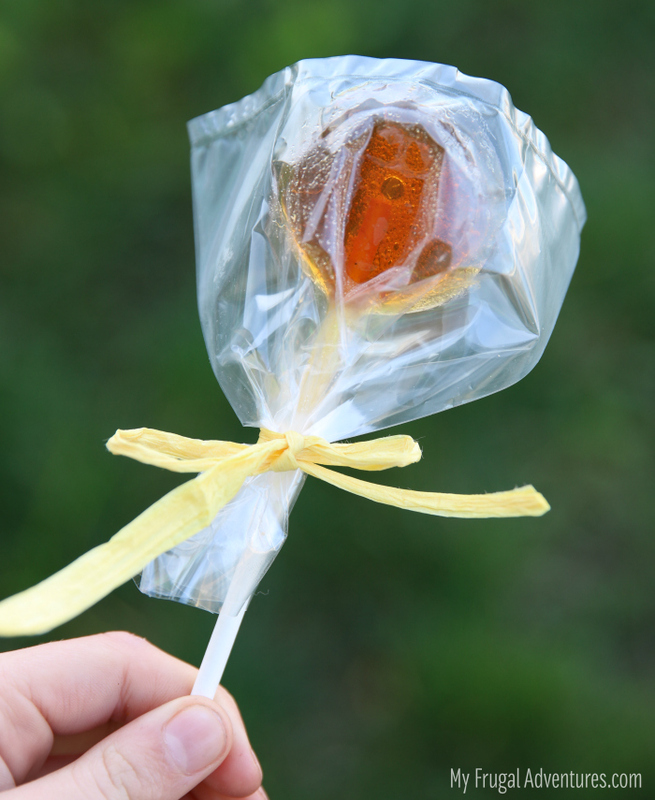 To make these little lollipops is really simple. 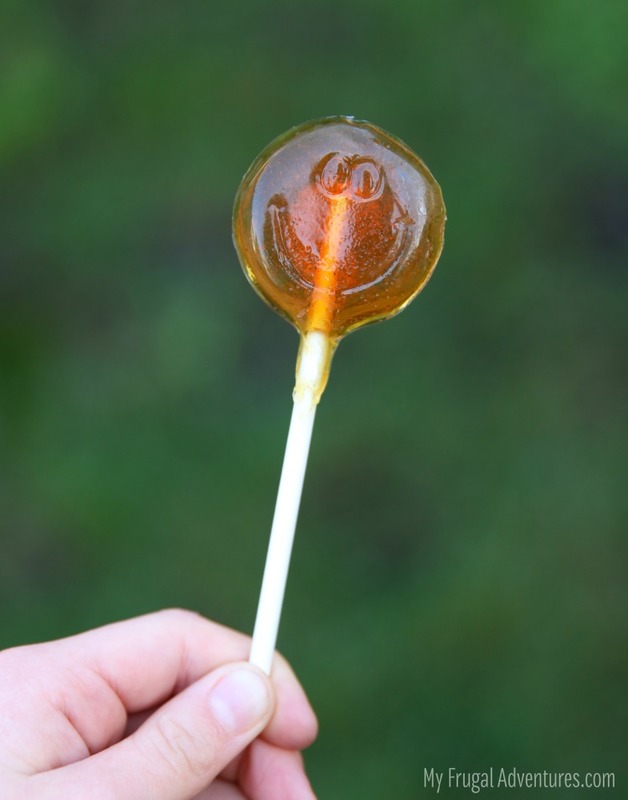 Just heat the honey with a splash of water and sugar (or skip the sugar), pop into a lollipop mold, let cool and that is it! You can add in some citrus zest if you like or maybe cinnamon- just depending on the flavor of honey you purchase. I found the cinnamon a little too strong with the honey I used but orange zest was absolutely perfect. My 8 year old loves honey so she really doesn’t need any added sugar (or very little added sugar). My older daughter does not like honey as much so she prefers more sugar and extra citrus zest. I have seen some recipes with up to a cup of sugar in these lollipops so really it is totally up to you to add as much as you like. 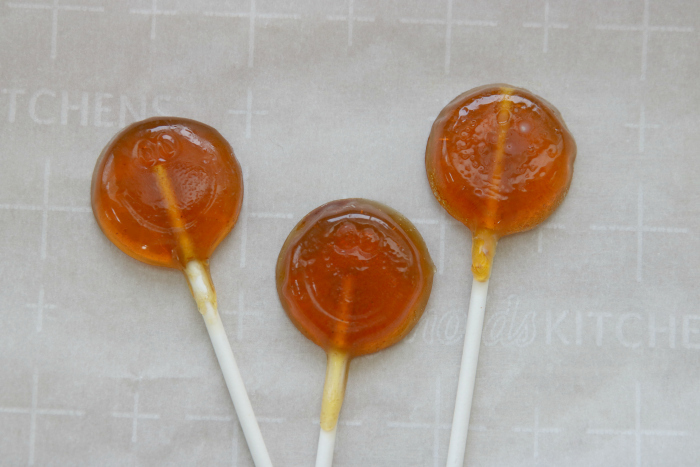 Soothing honey lollipops- perfect treat when you are under the weather. Add all ingredients to a saucepan and cook over medium heat for about 8 minutes or until it hits about 275 degrees on a candy thermometer. You want the temperature to reach about 300 degrees but I find the honey tends to burn unless I pull it off a little early. Quickly remove from heat- note these will go from perfectly done to burned in seconds so be prepared to move fast. Pour into lollipop molds or carefully pour into small circles on a parchment lined baking sheet. Once poured into mold, add a lollipop stick and allow to cool completely - at least 1 hour- before popping out of the mold. These are extremely easy to make but you do want to be all set to put them together as you need to move very fast to get the hot honey into the molds before it starts to harden. These will harden quickly and I found the easiest way to get them out of the mold is to pop the mold from the bottom. Do not try to yank the stick of the lollipop up or it will break. Once they are out of the mold, put them in a little party bag and tie with a ribbon for a gift or pop into a Tupperware container for your own use. Done! This made about 6 lollipops for me. I found a cute smiley face lollipop mold at the craft store but you can also Click here to take a look on Amazon. I got my lollipop sticks from the craft store but click here to take a look online . You can use regular party bags but these pretzel treat bags are perfect . Just trim down to fit! Tried these…. They never set….. Most likely you are not getting the honey to the right temperature. They should hit about 300 degrees. Mine set within a few minutes so my guess is that could be the problem. Do you have a candy thermometer? I purchase naturally flavored blueberry honey and naturally flavored strawberry honey and I’m getting ready to try these for my grand baby who is very sick right now. She won’t touch the plain honey pops so pray this works. I’ll let you know. Thanks for the recipe. Oh I hope she gets better soon Susan 🙁 The flavored honey sounds wonderful!